We have yet more superficial political commentary about leadership struggles in federal Labor, the chaos of the Gillard Government, more erratic political polling that is interpreted as spelling a big disaster for Gillard Labor, and election race calling. It's a shock horror meme from a mainstream media, whose central narrative is one of the Gillard Government being a failure and in disarray. The over-hyped scandal meme is 'constant crisis'---the standard News Ltd text, for instance, –is ‘disarray’, ‘rocked’, ‘dramatic’, ‘frantic’, ‘shambolic’, chaotic. Every event that happens is plugged into the never ending disaster meme, as are the political rumours and journalist speculations about what might happen. It's the 'government teetering on the brink' narrative. It’s difficult to escape the conclusion that this is the sort of thing that happens when a social democratic party trades away most of its social democracy for the ideology of its opponents – free-market capitalism – and then attracts and rewards highly ambitious numbers-men....When a party is struggling to articulate its purpose, it’s no wonder some of its key agents run out of puff early. According to Marks, the ALP has lurched from one panicked reaction to another. So Mark's "analysis" also buys into, and reinforces, the constant crisis narrative built on media beat-ups. Why not explore an alternative or competing narrative: the Gillard Government is still standing and reforming in spite of the relentless attacks on it from the mainstream media, the Coalition and the Big Business. Why not analyse the difficulties and limits of a social democratic mode of governance in a low growth global economy where the economic outlook is deteriorating. Or what is happening to social democratic governance with an economy in structural transition? If the Gillard Government has lurched from one panicked reaction to another, then this minority government is residing over low inflation, low interest rates, low unemployment, a massive investment boom, a “safe haven” currency, growing labour productivity, a sharemarket up nearly 20% since a carbon price commenced. How did this happen? Marks offers no account for the gap between his narrative and the current state of the economy. The media commentary about resignations of Chris Evans, leader of the party in the Senate, and Attorney General, Nicola Roxon, are much ado about nothing. The Gillard government is in meltdown because two senior ministers resigned and they planned to do so for a year or more? Abbott's Liberals see the past, and hope for the future, through the proverbial “rose-colored glasses” of the Howard decade. They yearn to take us back to the golden decade. Marks appears to be typical of "The Conversation", superficial and either scared or complicit. I check it out now and then but really it is of limited worth, sadly just about everywhere else is several degrees of worse. The MSM is becoming ever more outlandish and hyped in its negativity towards the Gillard Government. Fairfax is increasingly adopting a tabloid tone----Cabinet in Chaos!---even though two cabinet ministers have resigned for personal and legitimate reasons. The Canberra Press Gallery are at it again---writing about a leadership challenge from Rudd against Gillard. 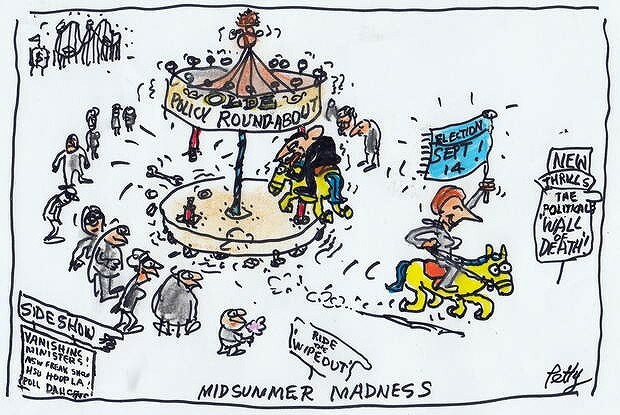 One example from Dennis D Shanahan in The Australian. Another example in The Age. we are going to be deluged with more horse race journalism from the mainstream media over the next 7 months. Yes, I share the sentiments expressed here. The msm perform like a pet dog or child carrying on for attention, and it has been a good week to be doing things other than read what passes for political commentary in the press, or watch it or listen to it on tabloid media. Not that we should overestimate the public's ability to see through BS, or underestimate its complicity in a system that furtively dodges its own professed values. judging by last week, journalists are now reporting – anonymously – every wild and often hysterical outburst by Labor people, without ever asking these people to put their names to this stuff . They are also doing the same with every Liberal political rumour and talking point. Even worse they treat their own speculations about what might happen as fact. The MSM are going to yell chaos and conflict at every opportunity--until the election. They realize that less and less people are listening to them, so they are becoming ever more shrill in order to be heard.